This might be the prettiest Mars pan yet. Nothing to say here, except this is a pretty amazing pan. 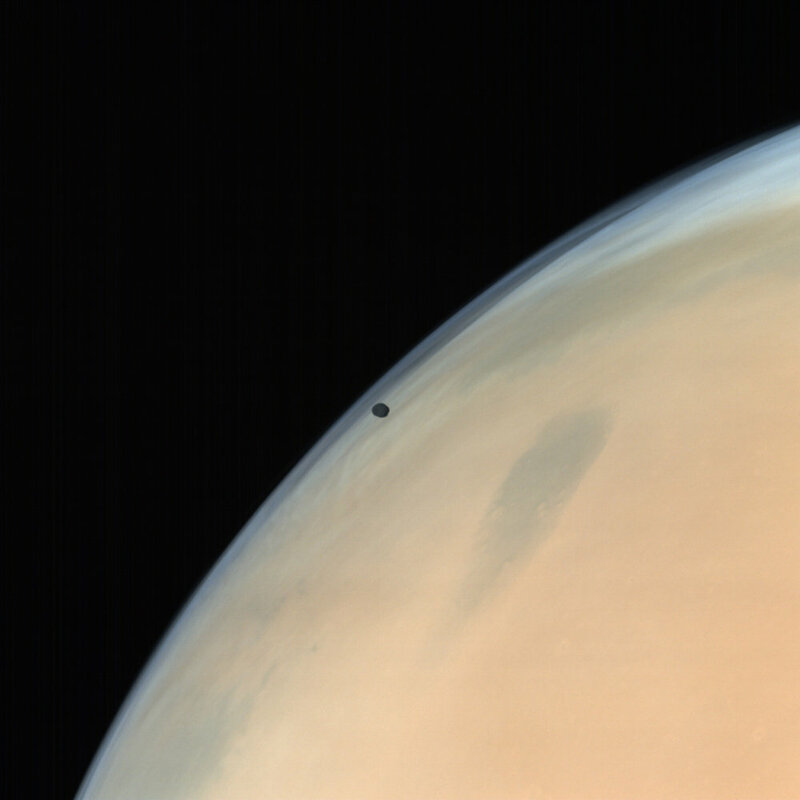 Mars' inner moon Phobos appears far darker than the bright clouds of Mars in this view taken by the Indian Mars Orbiter Mission on October 14, 2014. Image by Emily Lakdawalla for Planetary Society. Another one definitely worth clicking to see the full-resolution. Image by Justin Cowert and more information on his Flickr page. The first time we had one of these it was shot by Spirit in 2006 and then this one last year also by Curiosity. Even though this sunset lacks the tiny disc of the sun, this image beats the previous sunset image for my hard-earned-cash. You know how your Mother will always take the most predictable pictures at the holidays? Well, the Mars Orbiter Mission has done exactly that with it’s recent global image of Mars and it turns out to actually be quite a rare image. Despite so many probes being active at Mars at once, most are too close to the planet to be able to capture a full disc image like this. It is also the first interplanetary space mission for the Indian Space Research Organization and is really just a technology demonstrator for the group. This makes India only the fourth space agency to reach Mars and quite an accomplishment to do so successfully on it’s first try. To provide context for that statement, here is a list of missions to Mars and all the ones listed in bold (most spectacularly) failed to reach their goals. So Wanderingspace is happy to welcome another active player to the field of planetary exploration. So this is not new, but my lack of activity on WS has me missing many great moments. Since I view this site as more of an archive of amazing space imagery… there is no expiration date on any image. Above is Mars Curiosity as it parachutes to the Martian surface as seen from orbit by Mars Reconnaissance Orbiter. Colorization was added by Ian Regan. And a semi-recent image from Curiosity of Mount Sharp from August 2013. Occasionally they find things on Mars that I don’t bother posting because they are obviously bits of plastic that fell from descent, or are just shadow tricks. But this one has me and others scratching our collective heads. It really seems to be “growing” from the rock below and is clearly a shiny metallic material. Possibly a dropped Martian hammer? Back in 2007 I posted this image of a dark hole on Mars. In late 2011 they took additional images of a similar feature with the HiRISE cameras on Mars Reconnaissance Orbiter. Turns out it is in fact a “sky light” or a hole in the surface to an underground cavern. This one spans 35 meters (115 feet) across and 20 meters (65 feet) deep. It’s origins are likely due to ancient lava flows that continued underground and eventually were drained to leave behind a cavern. How vast such a system might be is yet unknown. 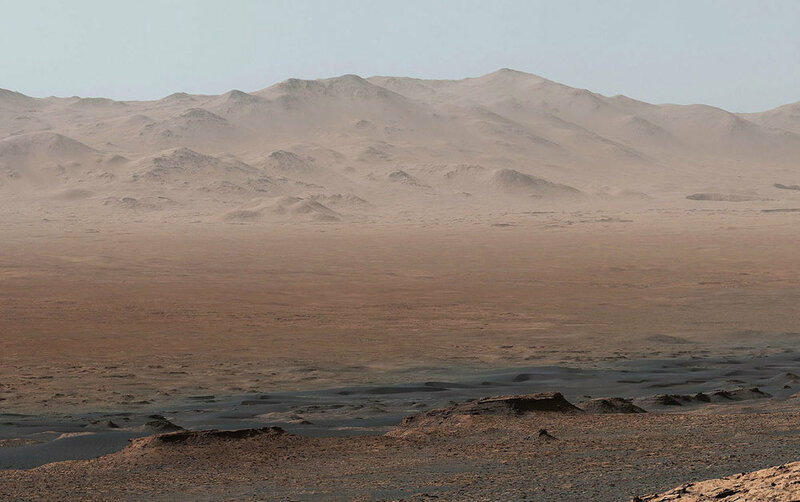 The background hills are not just all… the whole “sky” in the back is actually the Gale crater rim. Wish there was an additional image taken above to stitch together for the full dramatic view. I have a whole lot of catching up to do with Curiosity. I was locked out of the site for months and only got back in after the landing. So I missed much of the buzz and excitement of the first few days. We got spoiled from the everyday images from Spirit and Opportunity and sometimes the images from Curiosity will often feel like more of the same, but I don’t recall any images from the previous landers looking like a Chesley Bonestell painting. I last wrote about this mission in 2007. Now it is actually upon us. So never mind the launch… what is remarkable about this trip is when it arrives. JPL commissioned this incredible animation that is so real you feel like it was videotaped live. This is expected to take place August of 2012.